Tannishō, also known in English translations as Passages Deploring Deviations of Faith or A Record in Lament of Divergences is one of the most significant religious and philosophical works in Pure Land tradition of Buddhism, in so called Shin Buddhism. It is not written by the great Master Shinran Shōnin himself, but by one of his close students - Yuienbō – probably about 1280 – some 18 years after the departure of Shinran – to refute deviations from the true faith that had arisen among Shin followers. I recommend you to read more detailed foreword to Tannishō and the Pure Land tradition on a separate page, reserving the rest of this page to the text of Tannishō itself. Tannishō: Passages Deploring Deviations of Faith given below in English translation from Japanese by Shōjun Bandō & Harold Stewart according to CC Creative Commons License. When I reflect with deep humility upon the past and the present, I cannot help but deplore the prevalence of various deviations from the true faith transmitted by word of mouth from our late Master. So I feel concerned about possible doubts that may arise in the minds of future inheritors of the faith. Unless guided by a karmically related teacher, how could anyone expect to enter the gate of easy practice? Nobody should defile the doctrine of the other-power by his own arbitrary interpretations. Therefore I have recorded here the gist of what the late Shinran Shōnin told me, while it still reverberates in my ears. This has been written solely to clear away in advance any uncertainties that might arise among fellow devotees. So much by way of foreword. “At the very moment when we are moved to utter the Nenbutsu by a firm faith that our rebirth in the Pure Land is attained solely by virtue of the unfathomable working of Amida’s Original Vow, we are enabled to share in its benefits that embrace all and forsake none. We should realize that Amida’s Original Vow never discriminates between the old and the young, the good and the evil, and that what matters most is the heart of faith alone; for the vow was originally made for the purpose of delivering sentient beings sorely defiled by their vices and passions. “Your earnest aim in coming all the way here to see me, crossing more than ten provinces at the risk of your lives, is solely to enquire of me the way to rebirth in the Land of Supreme Bliss. Nevertheless, should you honour me by supposing that I am withholding any esoteric way for rebirth in the Pure Land or that I know of scriptural sources other than the Nenbutsu, you go seriously astray. Should you harbour such ideas, then there are a number of authoritative scholars in Nara, the Southern Capital, as well as on Mount Hiei, the Northern Peak, whom you should visit and ask to your heart’s content about the essentials for rebirth in the Pure Land. “For me, Shinran, there is no alternative but to accept and trust in the teaching of my master Hōnen: that simply by uttering the Nenbutsu I shall be given deliverance by Amida. Is the Nenbutsu really the seed of rebirth in the Pure Land, or is it a karmic cause of falling into the lowest hell? Of such questions I know absolutely nothing. Even if I had been deceived by my master, Hōnen Shōnin, and were to fall into hellish torment, I would have no regrets at all! The reason is that, had I been one who was certain to attain Buddhahood by striving at some other spiritual discipline and yet fell into an infernal state through uttering the Nenbutsu, I might well be justified in regretting that I had been deceived. But as I find myself totally incapable of any kind of meritorious deed, the lowest hell would in any event be my destined abode. “If Amida’s Original Vow is unfailing, then Śākyamuni’s teaching cannot be false. If Śākyamuni’s teaching is true, then Shandao’s sacred commentaries cannot be unfounded. If Shandao’s commentaries are well founded, how can Hōnen Shōnin’s sayings be in error? If Hōnen Shōnin’s sayings are trustworthy, how then can what I, Shinran, am telling you be in vain? The reason is that since a person who does deeds of merit by his own effort lacks total reliance on the other-power, he is self-excluded from Amida’s Original Vow. But as soon as his attitude of self-effort is redirected and he dedicates himself exclusively to the other-power, his rebirth in the True Land of Reward is at once assured. “It was solely to enable the wicked to attain Buddha-hood that Amida took his vows, out of compassion for those like us who, defiled to the core, have no hope of liberating ourselves from the cycle of birth and death through any other discipline. And so an evil person who dedicates himself to the other-power is above all endowed with the right cause for rebirth. “There is a divergence between the compassion of the path of sages and that of the path of the Pure Land. The compassion of the path of sages commiserates with and cares for sentient beings, and yet it is least likely to succeed in liberating them as completely as could be wished. But the true compassion of the Pure Land path consists in calling the Nenbutsu, thereby quickly attaining Buddhahood, and then benefiting all sentient beings with the heart of great compassion and kindness as fully as possible. Because, as you know, no matter how much sympathy and pity we may feel for others in this life it is difficult to save them, as we would wish; our compassion is not thorough- going. “I, Shinran, have never called the Nenbutsu, not even once, out of filial piety for my deceased parents. The reason is that through karmic relations during numberless rebirths, all sentient beings are or have been my parents or kinsmen. So we should attain Buddhahood in the next life and then we shall be able to bring deliverance to all other beings. “If the Nenbutsu were a deed of merit that could be done by our own efforts, we could deliver our parents by transferring that merit to them. “It is unbelievable that any dispute should have arisen among those who devote themselves to the exclusive practice of the Nenbutsu as to who are my disciples and who are the disciples of others. I, Shinran, do not have a single disciple of my own. The reason is that if I could induce others to call the Nenbutsu through my own influence, then they might well be called my disciples. But it is utterly absurd to call them my disciples when they repeat the Nenbutsu through the influence of Amida Buddha. “When karmic conditions are favourable, master and disciple must meet: when adverse, they must part. Despite this, there are those who disconcert the faithful by saying that if they desert their present master and repeat the Nenbutsu while following some other master, their rebirth in the Pure Land can never be attained. At this, words fail me. Do they mean that they wish to revoke the faith called forth by Amida Buddha, as though it were their own? I reiterate that this view must never be allowed to prevail. “The Nenbutsu is the one unobstructed path. This is because the gods of heaven and earth bow down in reverence before the devotee of the true faith, but he can never be hindered by the realm of demons or by adherents to heterodox views. “For the devotee the calling of the Nenbutsu is neither religious observance nor moral worthiness. It is not a religious observance because it is not done by his own design. It is not a moral deed since it is none of his own doing. “Even when I call the Nenbutsu, I rarely feel like dancing for joy, nor do I have any fervent longing to be reborn in the Pure Land. Why is this so?” I asked. “There was once a time when I, Shinran, also had doubts on this question. Now, Yuienbō, I find you sharing the same doubts. But when I reflect on this more deeply, I realize that our rebirth in the Pure Land is all the more assured because we cannot feel like dancing for joy as we would wish. That is how you should think of this problem. It is defilement by evil passions that oppresses our hearts and prevents us from rejoicing. But since Amida Buddha, knowing this already, has called us ‘common beings defiled by ignorance,’ I realize that the compassionate vow of the other-power was made for the benefit of just such defiled beings as ourselves, and so I feel it all the more worthy of trust. “Moreover, when we have no longing to be reborn instantly in the Pure Land, if we fall even slightly ill, we feel helpless with the fear of death. This is likewise because of our evil passions. How strong indeed must they be when we find it so hard to leave our native land of suffering, where we have been wandering through birth and death for numberless kalpas, and when we can feel no longing for Amida’s Pure Land, where we have yet to be reborn! We are reborn into that land when we have exhausted, even though reluctantly, our karmic relations to this world of suffering and end our lives helplessly. So Amida pities above all those who feel no urgent longing to go to the Pure Land. Reflecting on this, we realize all the more how trustworthy is Amida’s great compassionate vow and how firmly our rebirth is assured. “The meaning of the Nenbutsu lies in its freedom from contrivance, because it is imponderable, indescribable, and inconceivable,” the Master said. Now years ago, when the Master was still alive, those sharing the one faith and aspiring to the Land of Reward to come, who with a common aim underwent the hardships of travelling to Kyoto the distant capital, all had the privilege of hearing the teachings from him at the same time. And yet it is rumoured of late that among the numberless converts, both young and old, who recite the Nenbutsu under the guidance of those direct disciples, there are not a few who expound doctrines contrary to the Master’s intention. The following are some of those groundless doctrines. “Do you utter the Nenbutsu with faith in the wonder of the Original Vow or with faith in the wonder of the Name?” but without clearly distinguishing between the two. This distinction should be looked into carefully. we utter the Nenbutsu in the faith that through the working of Amida’s will we shall be delivered from the cycle of birth and death by the wonder of Amida’s great compassionate vow. Understanding it in this way, we shall be perfectly in accord with his Original Vow and shall be reborn into the True Land of Reward with no room for self-will at all. In this sense, if we have faith in the wonder of the Vow, it embodies the wonder of the Name, and so the wonder of the Vow and the wonder of the Name are one and not two. Again, if some think that good deeds are a help and bad deeds a hindrance to rebirth, then by this distinction they are not trusting in the wonder of the Vow, but are calling the Nenbutsu by their own efforts. Such followers lack real faith in the wonder of the Name. And yet, even though wanting in faith, they may still be reborn in the borderland of the Western Paradise (also called the realm of sloth and pride, the castle of doubt, or the matrix palace) and will at last attain rebirth in the Land of Reward by virtue of the vow of ultimate deliverance. All this is accomplished by the wonder of the Name, which is no different from the wonder of the Vow, for they are one. Some hold the view that those who do not read or study the sutras and commentaries will not be assured of attaining rebirth in the Pure Land. This view is not worth taking seriously. Various scriptures that make clear the truth of the other-power stress that we are certain to attain Buddhahood only when we have faith in the Original Vow and recall the Name. So for rebirth in the Pure Land what else do we need to study? To be sure, those who are uncertain of this truth ought to study hard if they wish to grasp the purport of the Original Vow. But how pitiful indeed if, after all their reading and study of the sutras and commentaries, they still fail to grasp the real meaning! Because the Name can easily be repeated by those who are unlettered and ignorant of what the sutras and commentaries mean, it is called the easy way; whereas the path of sages, being founded upon learning, is called the difficult way. I am doubtful of the immediate rebirth in the Pure Land of anyone who engages in scholarly pursuits while mistakenly attached to thoughts of wealth and fame. At present, followers of the exclusive practice of the Name and adherents to the path of sages are engaged in disputes about doctrine, each holding that his own is superior and that of his opponent inferior. Thus adversaries of the teaching arise and calumny against the Dharma is committed. Does not this amount to reviling one’s own teaching? “As we are convinced that the ignorant who are poorly gifted and illiterate like ourselves will be delivered by faith, for us this is the supreme doctrine, even though it may seem contemptible to those of higher ability. Although other teachings may be superior, we cannot practice them because they are beyond our powers. Since the original intention of all the Buddhas is to free everyone from birth and death, we request those of other views not to interfere with us: ”If we treat them without malice, who then will harm us? The wise person should stay as far away as possible from controversy, as this passage in the Scripture of the Accumulation of Jewels testifies. As the Buddha foretold, some would trust in this teaching, while others would revile it. Since I already have faith in it, whereas others find fault with it, I know that what the Buddha said is true. Because of this, we should feel confident that our rebirth is all the more certain. If, by chance, no one happened to speak ill of the teaching, we might wonder why, when there are those with faith, there are no fault-finders. I do not wish to say that the doctrine must necessarily be reviled, but simply that the Buddha, foreseeing that there would be scoffers as well as faithful, warned his followers not to harbour doubts. Nowadays some appear to study only in preparation to engage in disputes and controversies and to counter the calumny of others. But the more one studies the more one should realize the true intention of the Buddha and become aware of the infinitude of his compassionate vow as well. Only he is worthy of the name of scholar who explains to those in doubt that, as poorly gifted people, they can attain rebirth, and that the Original Vow makes no distinction between good and evil, pure and impure. Anyone who asserts that study is necessary, intimidating even those in whom the Name is called selflessly in accord with the Vow, is a diabolical obstruction to the Dharma and an adversary of the Buddha. Not only does such a person lack faith in the other-power, but he is also sure to lead others into error. We should be particularly cautious about acting against the intentions of our late Master. At the same time such opponents are to be pitied for not being in accord with Amida’s Original Vow. It is said that those who are unafraid of evil because of Amida’s Original Vow presume too much on its miraculous power, and so fail to attain rebirth. Those who speak thus betray their doubt of the Original Vow and their ignorance of good and evil deeds in past and present lives. The arising of good thoughts is caused by past good, while evil thoughts arise because of the working of past evil. Even a defilement as minute as a speck of dust on the tip of one hair of rabbit’s fur or sheep’s wool could not come about without karmic causes in the past. To this I respectfully gave my assent. “If so,” Shinran asked, “Why did you just now promise that you would not disobey me?” and then continued: “From this you should learn that, if you could do anything you wished, then should you be told to kill a thousand people so as to attain rebirth, you could commit murder. But since there is no karmic cause within you to murder even one person, you simply cannot kill; it is not because you have good intentions. Even though you had no intention to kill others, it could come about that you might murder a hundred or even a thousand people. He taught that because of the all-embracing vow to deliver evildoers, one should deliberately commit evil deeds as a means of attaining rebirth. When news of his various misdemeanours reached the ears of Shinran Shōnin, he admonished his followers in a letter with these words: “Just because you possess the antidote, do not become addicted to the poison.” With this saying he meant to put an end to such perverse attachments; he did not at all mean that evil deeds could obstruct rebirth. “If we could trust in the Original Vow only by observing the moral precepts and by obeying the many rules of the Order,” he said, “how could we ever deliver ourselves from birth and death? This holds true for those who gain their livelihood by casting nets in the sea or fishing by the river, those who hunt birds and beasts in the mountains and fields, and those who trade or till the soil. Shinran Shōnin remarked that “When karmic conditions are opportune, we are capable of committing any evil!” and yet at present there are some who assume a pious air of seeking the afterlife, as though only good people were entitled to call the Name; and they post up notices in halls of worship prohibiting admission to those who have transgressed. Are not such people only pretending outwardly to be wise and zealous, while inwardly remaining false and deceitful? Even those evil deeds committed because of overconfidence in the Vow are caused by past karma. That being so, if we leave all deeds, good and bad alike, to karma and place our sole reliance on the Original Vow, we are really in conformity with the other-power. Our faith in the other-power is confirmed all the more because our hearts feel overconfident in their reliance on the Original Vow. It might possibly be better for us if we could have faith in the Original Vow after we have rid ourselves of evil karma and defilements, because then we would not need to have any overreliance on it. But if we were able to rid ourselves of all defilements, we would already be Buddhas, for whom the Vow fulfilled by five kalpas of contemplation would not be needed. Those who admonish others not to be overreliant on the Original Vow nonetheless themselves appear to be filled with defilements and impurities. Are they not also placing too much reliance on the Vow? Just what kinds of evil are meant by “having too much reliance on the Vow” and “not having too much reliance on it”? After all, is not this a shallow argument? There are some who insist that one should believe that the heavy burden of evil karma accumulated during eight thousand million kalpas is wiped out by a single calling of the Name. This assertion seems to refer to one who has committed the ten evils or the five criminal acts, and has never called the Name during his lifetime but who, when faced with death, for the first time meets with a good teacher of the Way. This teacher then instructs him that with one calling of the Name the evils of eight thousand million kalpas will be wiped out, and that with ten callings of the Name the grave karmic burden of ten times eight thousand million kalpas will be expunged, and so rebirth attained. This passage in the Contemplation Sutra concerning one calling and ten callings was per- haps referred to in order to make us realize the gravity of the ten evils and the five criminal acts. It points out the benefit of the extinction of evils, but it still falls short of our faith. This is because at the instant when the single thought of faith arises in the heart by Amida’s light shining on it, one is endowed with the diamond[like] faith, and the rightly established state has already been reached. When one’s lifetime is over, all defilements and hindrances are transformed into the realization that there is no birth and no death. How can such debased evildoers as we are be delivered from birth and death without his compassionate vow? Bear this thought in mind and regard all the callings of the Nenbutsu throughout your life solely as an expression of your indebtedness to Amida’s great compassionate heart and of your gratitude for his favour. Those who are convinced that each calling of the Name can erase the effects of their evil karma are really trying to wipe them out so as to attain rebirth by their own efforts. If this were true, since every thought that we have during our lives binds us to birth and death, rebirth would only be possible by calling the Name without cease up to the very moment of death. But meanwhile, because the effects of past karma have their own limit, we might die without right mindfulness through meeting with an unexpected accident or through being afflicted by the agony of disease, and in the event the Name would be difficult to call. How then could we wipe out the effects of evil committed during that interval? Do such people insist that, unless the effects of evil karma be effaced, our rebirth is unattainable? Even though, because of unforeseen events, we may do wrong and die without calling the Name, if we place our trust in the vow that embraces all and forsakes none, we shall immediately gain rebirth. Moreover, even if we are able to call the Name during our last moments, we shall still only be expressing our gratitude to Amida, placing our reliance all the more on him as the moment of our enlightenment draws nearer. The desire to wipe out the effects of past offenses is still self-power, and this is the intention of one who prays to maintain equanimity during his last moments. This shows that he lacks the faith of the other-power. There are those who claim that we have already gained enlightenment, even while our bodies are still defiled by the passions. This view is quite unacceptable to us. To attain Buddhahood while still in this body is the essence of the secret teachings of Shingon and is the result of the three esoteric practices. The purification of the six senses is taught by the One Vehicle of the Lotus Sutra, and this is attained by practicing the four peaceful observances. But these are all stages along the difficult path, which can be followed only by those specially endowed and belong to the enlightenment attainable only by meditational methods. The basic principle of the other-power teachings of the Pure Land school is to gain enlightenment in the next life, since it follows the path of the assurance of faith. Besides, it is the easy way that can be followed by those of poor ability and is a teaching that does not discriminate between good and evil adherents. Because, moreover, it is almost impossible to eliminate defilements and hindrances during this lifetime, even the holy monks who practice Shingon and Tendai methods still look forward to reaching enlightenment in the next life. How much truer is this of those of us who lack in discipline and wisdom! As soon as we have reached the shore of the Pure Land, the dark clouds of the defilements will instantly be cleared away and the enlightening moon of Buddhahood will at once appear. We can only claim to be enlightened when we are at one with the light that shines unobstructed in the ten directions to benefit all sentient beings. Do those who claim that they have already attained enlightenment while in their earthly bodies freely expound the Dharma to benefit all beings by manifesting in various bodily transformations possessing the thirty-two major and eighty minor marks of physical perfection, as Śākyamuni did? For these form the paradigm of enlightenment attained in this life. In that instant when faith as hard as diamond is established, the light of Amida’s heart enfolds us in its protection and we are forever separated from birth and death. The meaning of this hymn is that, because at the moment when faith is established we are embraced once and for all and never after forsaken, we shall never again wander through the six realms of existence. This is why we are said to be “separated forever from birth and death.” Why should this be misunderstood as “attaining enlightenment”? How regrettable! Some insist that the devotee of the Nenbutsu should repent whenever he chances to lose his temper, to do wrong, or to quarrel with his fellows. This view savours of eliminating evil and practicing good. For the devotee of single-minded and exclusive practice of the Nenbutsu this change of heart happens only once, when he who has hitherto been ignorant of the true teachings of the other-power of the Original Vow now realizes through Amida’s wisdom that he will not attain rebirth in the Pure Land with his habitual moral outlook, and so abandons his former views and henceforth relies solely upon the Original Vow. This is the true meaning of con- version. If it were necessary to repent all errors, morning and evening, in order to gain rebirth, the vow that embraces all and forsakes none would have been made in vain, since before a person could repent and dwell in tender forbearance, his life might first end between one breath and the next. Such people give lip service to the power of the Vow, but in their hearts they still secretly harbour the thought that, although the Vow is said to have been meant for all people, in truth it will only be good people who are saved. It is to be deplored that, by so thinking, those who doubt the effectiveness of the Vow and are wanting in trust in the other-power will be born in the borderland of the Western Paradise. Once faith has been firmly established, rebirth is gained by the favour of Amida, and therefore not through one’s own efforts. The more we rely on the power of the Vow as we realize our evil karma, the more will tender forbearance spontaneously arise in us. In all that concerns rebirth we should always gratefully bear in mind, without any pretension to wisdom, our deep indebtedness to Amida’s favour. The natural outcome is that the Nenbutsu is called. Lack of artfulness on our part is called “naturalness,” which in truth is the working of the other-power. In spite of this I have heard of those who knowingly say that there is some other kind of “naturalness.” How regrettable this is! There are others who claim that he who gains rebirth in the borderland of the Western Paradise will ultimately fall into hell. In what scriptural source is this view to be found? It is deplorable that such an assertion should have been made by those with pretensions to scholarship. How do they dare to interpret the sacred scriptures and commentaries? I heard from my master that devotees who lack faith will be reborn in the borderland of the Western Paradise because of their doubt in the Original Vow, but that when the karma of their doubt is exhausted, they will attain enlightenment in the True Land of Reward. Since devotees of the true faith are few in number, most followers are recommended to seek rebirth in the transformed Pure Land. And so to assert that all their aspirations will ultimately prove to be in vain would amount to accusing the Buddha of having led them astray! Again there are still others who say that, depending on the amount offered to the Buddhist order, one will become a greater or smaller Buddha. How utterly nonsensical this is! Such a view is ludicrous. First, one ought not to try to delimit the size of the Buddha, for when the stature of the supreme teacher of the Pure Land is described in the scriptures, this is an expedient form referring to his spiritual body. Since Amida embodies the realization of ultimate truth, surpassing all forms, long or short, square or round, and also all colours, blue, yellow, red, white, and black, how then can his stature be determined as large or small? 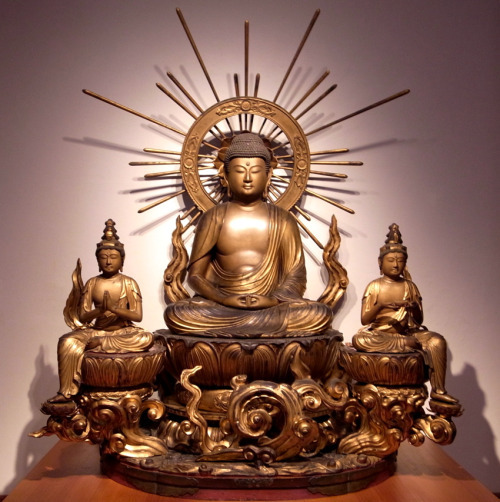 When it is said in the scriptures that by calling the Nenbutsu one will receive a vision of an apparitional Buddha, this seems to have given rise to the popular belief that by calling the Name in a loud voice, the devotee will see a large Buddha, and in a soft voice, a small one. The misinterpretation mentioned at the beginning must have derived from some such popular belief. Offerings to the order should be regarded as the practice of the perfection of generosity. But if faith is lacking, no matter what precious offering one may make to the Buddha or to one’s master, it will prove to no avail. Yet although one does not offer even a single sheet of paper or the smallest amount of money but in his heart is devoted to the other-power with deep faith, his attitude will be in accord with the true intention of the Original Vow. In all these deviations from the true faith by those who would intimidate their fellows under the pretence of upholding the Dharma, are they not themselves motivated by worldly greed? Such misinterpretations as these have definitely arisen through deviations of faith. There is a story told by our late Master Shinran that while Hōnen was alive he had many disciples among whom few were of the same faith. A dispute once arose between Shinran (then called Zenshin) and his fellow disciples because he had stated that his faith and that of Hōnen were the same. It would be absurd if I were to claim that I was Hōnen’s equal in wisdom and learning, for his are vast; but regarding our faith in rebirth, there is no difference at all, for his faith and mine are one and the same. As they were still in doubt, there was nothing left but to submit the question to Master Hōnen for his decision. My faith was conferred by the Buddha and so was Zenshin’s; therefore they are one. Those who hold a separate faith are the least likely to be reborn in the same Pure Land as I, Genkū. From this I deduce that even now among followers who seem single- heartedly and exclusively devoted to the Nenbutsu , there are some whose faith is not at one with Shinran’s. All I have said is only needless repetition, but still I have written it down so that, whenever I hear the doubts of my fellow devotees, I shall be able to convey to them as long as I continue to live, like a dewdrop on a withered leaf, what I learned from my master; and also because I fear that after my death further confusions may arise. Should followers who put forth such false views attempt to mislead you, you ought to read carefully those scriptures favoured and followed by the late Master which were in accord with his deepest convictions. From our viewpoint, in all the scriptures the true and actual teachings are intermingled with the provisional and expedient. The Master’s real intention was that you should discard the provisional and keep to the actual, put aside the expedient and abide by the true. You should take great care not to misunderstand the scriptures. As a standard of the true faith, I have chosen certain important passages, which I have appended to this book. When I reflect deeply on the Vow that Amida fulfilled after five kalpas of contemplation, I find that it was for me, Shinran, alone! How compassionate, therefore, is the Original Vow of Amida, who was moved to free me from so many karmic defilements! We should realize that in truth we are ordinary unenlightened beings involved in birth and death, who from the remotest past up to the present time have been forever floundering in Samsāra, and that we have no way of freeing ourselves. And so, by giving himself as an example, the Master’s words were meant to awaken us to our twofold ignorance: we are deluded as to the depth of our transgressions and unaware of the breadth of Amida’s beneficence. For others as well as myself speak only of good and evil without heeding the beneficence of Amida. I am completely ignorant of good and evil. If I could know what good was as totally as Amida does, then I could claim to know good; and if I knew evil as totally as Amida does, then I could claim to know evil. But I must confess that we are all ordinary beings beset by defiling passions and that everything in our world is as transient as a burning house. All things are illusory and delusive and have no truth in them. The Nenbutsu alone is true. Indeed, I myself as well as others speak only of idle things, of which the most regrettable is that when we discuss among ourselves or explain to others the meaning of faith, some impute to the Master words that he did not utter, merely to silence their opponents and put an end to the discussion. This is most deplorable, and we should be careful to discriminate in this regard. All these are not my own words and yet they may sound strange, because I am not well versed in the scriptures and commentaries nor have I grasped the depths of the doctrine. But I have remembered and set down here only a hundredth part of what the late Master Shinran taught. What a pity if one fortunate enough to call the Name should not be reborn directly into the Land of Reward but should stop short at its borders! So that there may be no divergences of faith among followers of our school, I have taken up my brush in tears and have written this down. It should be called the Tannishō or Passages Deploring Deviations of Faith, and ought not to be indiscriminately made public.